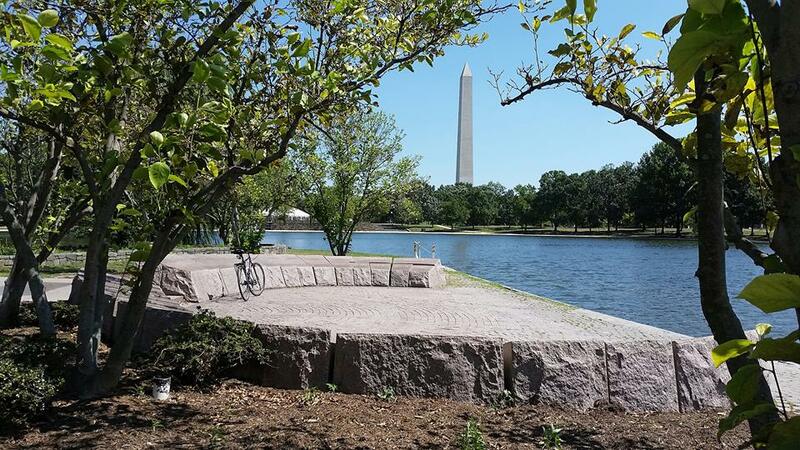 Memorials to historic figures of national significance are commonplace in D.C., but the memorial I visited on this lunchtime bike ride is dedicated to one of the most select group of important people in our nation’s history. 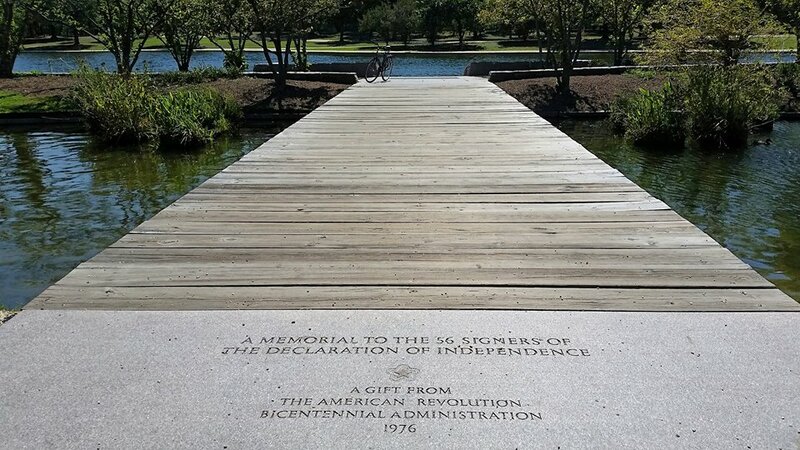 It is known as the Memorial to the 56 Signers of the Declaration of Independence, it is located on the island in the lake located in Constitution Gardens, which occupies 50 prime acres of landscaped grounds approximately halfway between The Washington Monument and The Lincoln Memorial. 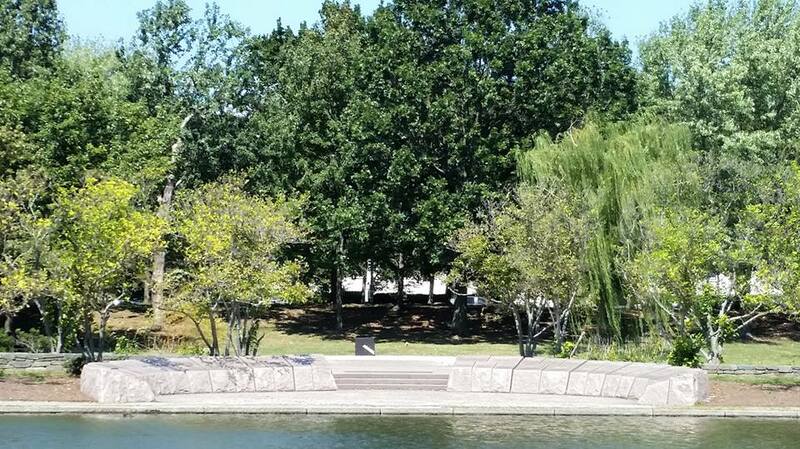 Located to the west of 17th Street and south of Constitution Avenue in northwest D.C. (MAP), the gardens are bordered on the west by The Vietnam Veterans Memorial and on the south by The Lincoln Memorial Reflecting Pool. 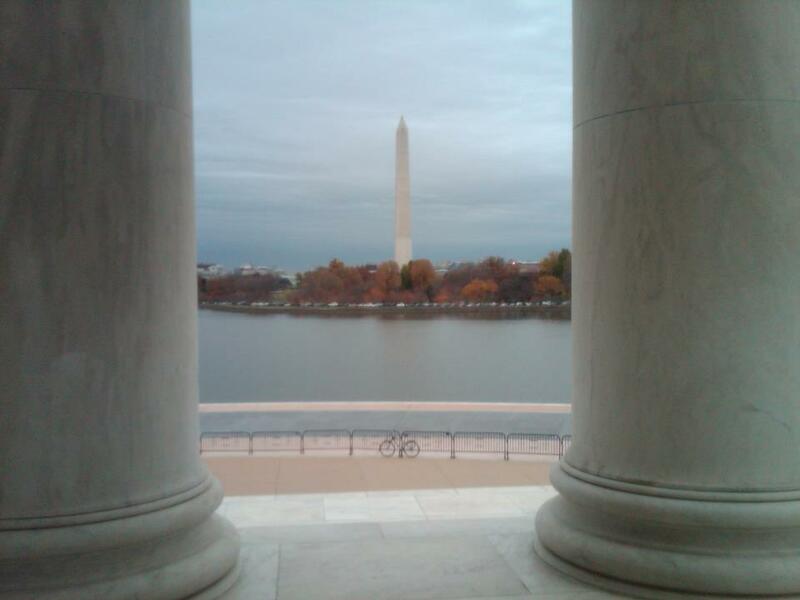 But despite its central location on the National Mall, it is a quiet haven in the heart of the bustling capital city. 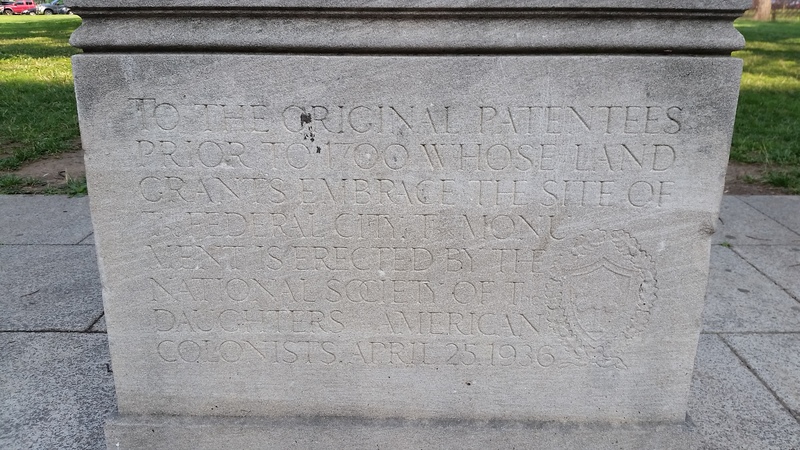 The memorial was a gift from the American Revolution Bicentennial Administration, and consists of 56 granite blocks which are inscribed with the signatures of the 56 delegates to the Second Continental Congress who signed the Declaration of Independence. 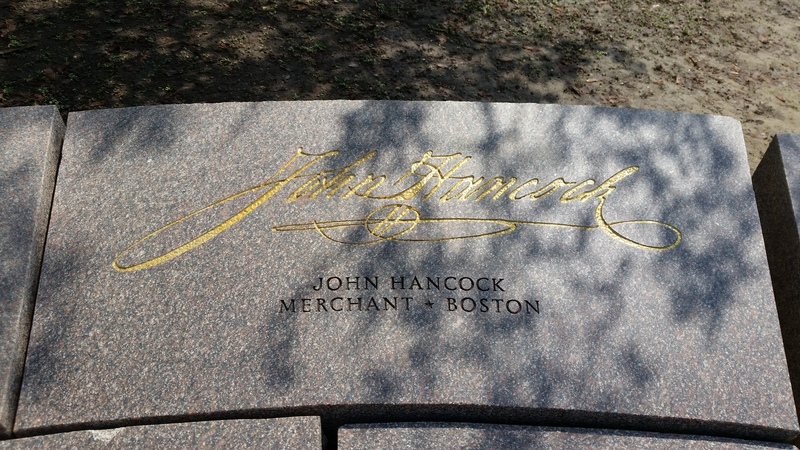 Each stone also contains the corresponding signer’s occupation and his home town. The signatures look just like the original pen and ink signatures which are on the bottom of the Declaration of Independence. 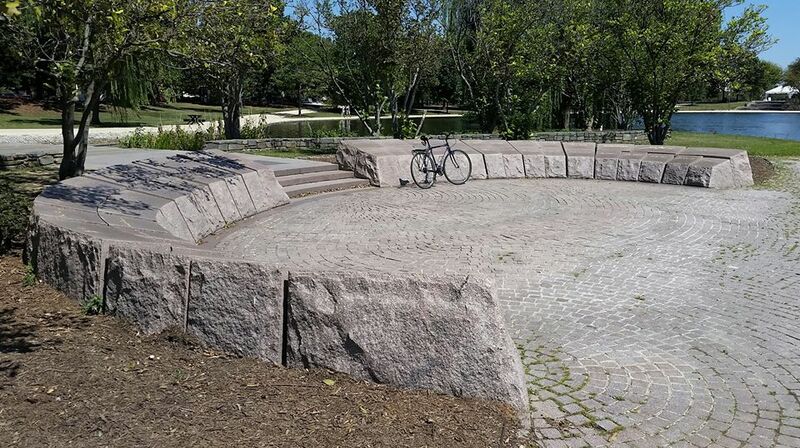 The granite blocks are then arranged in 13 groups, representing the 13 original states, and are grouped based on the home of the signer. It was designed by Landscape Architect Joseph E. Brown, approved by Congress in 1978, and construction was completed in 1984. It was then dedicated on July 2, 1984, exactly 208 years after the Continental Congress voted to approve the Declaration of Independence. Although Thomas Jefferson is often considered to be the “author” of the Declaration of Independence, he wasn’t the only person who contributed to its content. Jefferson was a member of a five-person committee appointed by the Continental Congress to write a Declaration of Independence. In addition to Jefferson, the Declaration Committee included Benjamin Franklin, John Adams, Robert Livingston, and Roger Sherman. However, one of the members of the committee, never signed it. Livingston believed that it was too soon to declare independence and, therefore, refused to sign it. 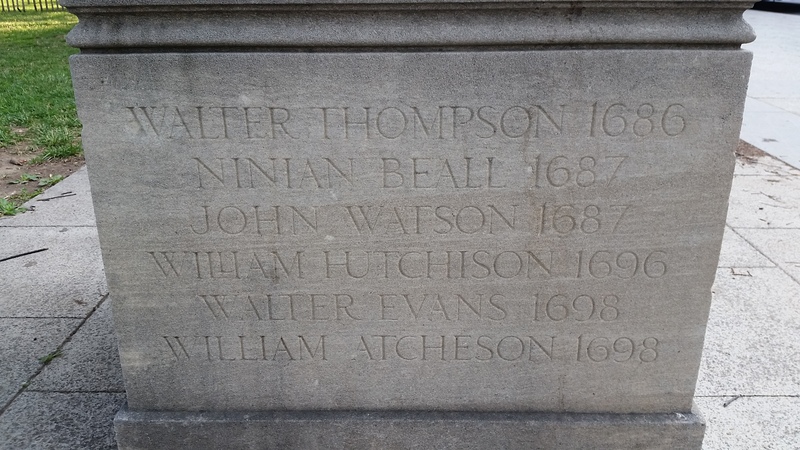 So although he is one of its authors, Livingston was not included in this memorial. After Jefferson completed the first draft of the Declaration of Independence the other members of the Declaration committee and the Continental Congress made 86 changes to Jefferson’s draft, including shortening the overall length by more than a quarter. 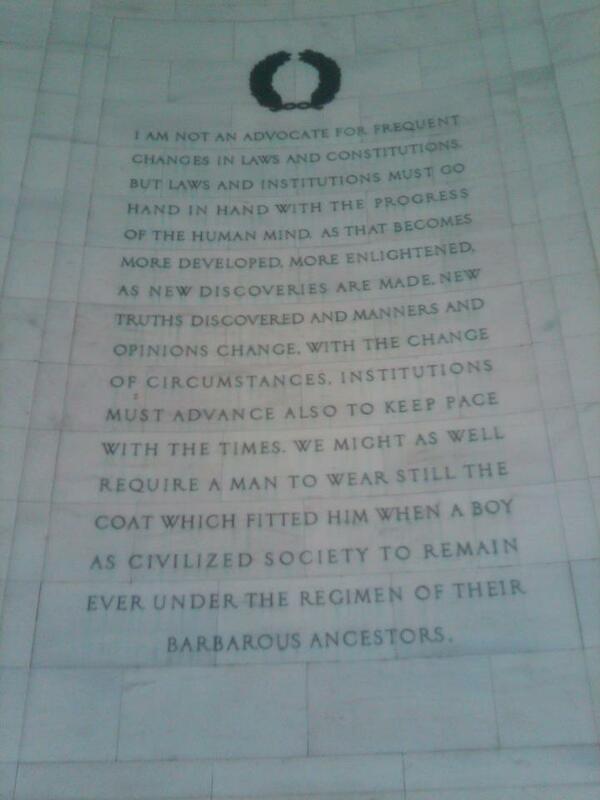 Jefferson was quite unhappy about some of the edits made to the original draft. He had originally included language condemning the British promotion of the slave trade, even though Jefferson himself was a slave owner. 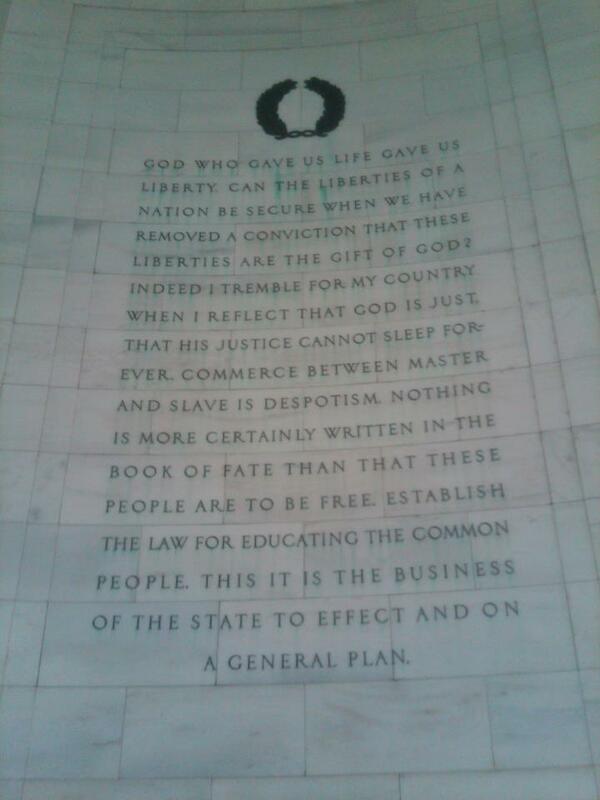 This criticism of the slave trade was one of the portions removed from the final version, despite Jefferson’s objections. Depending on perspective and how it was perceived at the time, the Declaration of Independence was considered to either form the foundation of a new, independent country, or as a document of treason against the King of England. And had events turned out differently, the only stones commemorating these “Founding Fathers” would have been their gravestones. But despite their success in launching the United States of America, many of these men paid a very steep price for signing the document and their involvement in the birth of this new nation. Of the 56 signers of the Declaration of Independence, a number saw their homes and property occupied, ransacked, looted, and vandalized by the British. Some were captured by the British during the course of the Revolutionary War, and subjected to the ill treatment typically afforded to prisoners of war during their captivity. Others saw their sons captured or killed while serving in the Revolutionary Army. Some even saw their wives captured and jailed by the British. 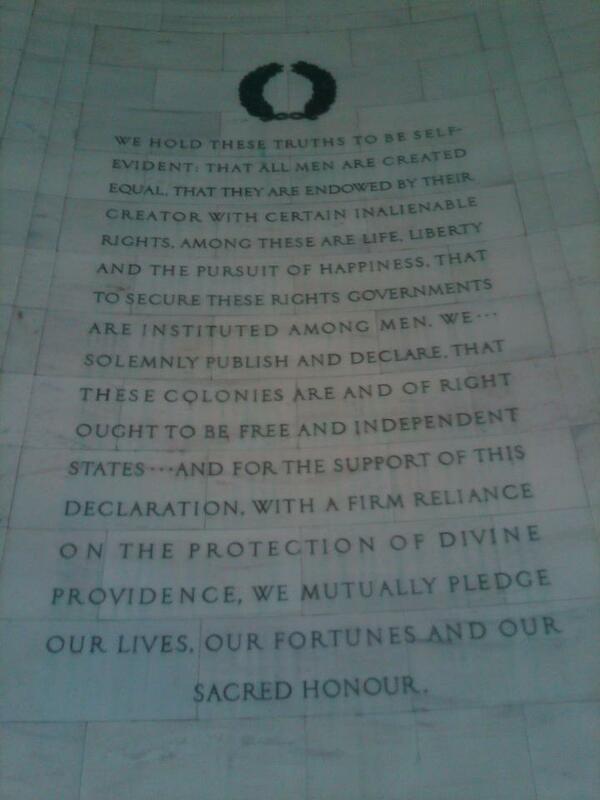 But despite what they would go on to sacrifice, each man, by signing the document, pledged: “For the support of this declaration, with firm reliance on the protection of the divine providence, we mutually pledge to each other, our lives, our fortunes, and our sacred honor.” It was this commitment that is honored in this memorial. However, one of the signers, a lawyer from New Jersey named Richard Stockton, became the only signer of the Declaration of Independence to recant his support of the revolution. On November 30, 1776, he was captured by the British and thrown in jail. After months of harsh treatment and meager rations, Stockton repudiated his signature on the Declaration of Independence and swore his allegiance to King George III. A broken man when he regained his freedom, he took a new oath of loyalty to the state of New Jersey in December 1777, and again supported the Revolution until victory was achieved in September of 1783. Despite once repudiating his signature and recanting his support for the Revolution, Stockton is nonetheless included on the memorial. 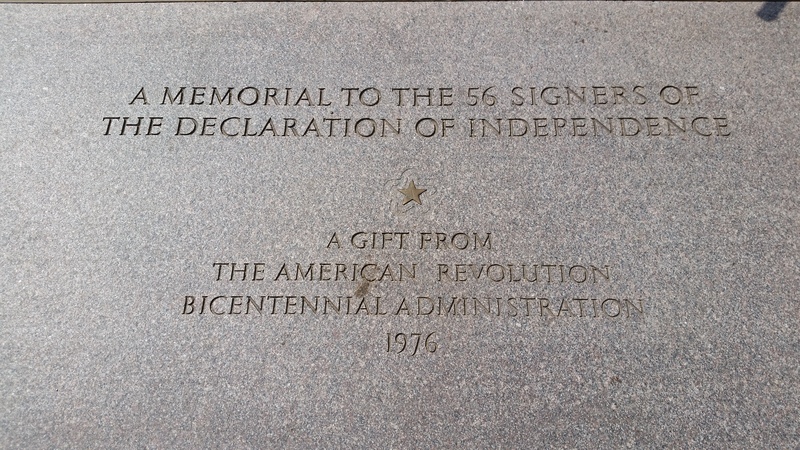 So this Memorial to the 56 Signers of the Declaration of Independence does not include one of the authors of the Declaration, but does include a signer who later repudiated his signature. 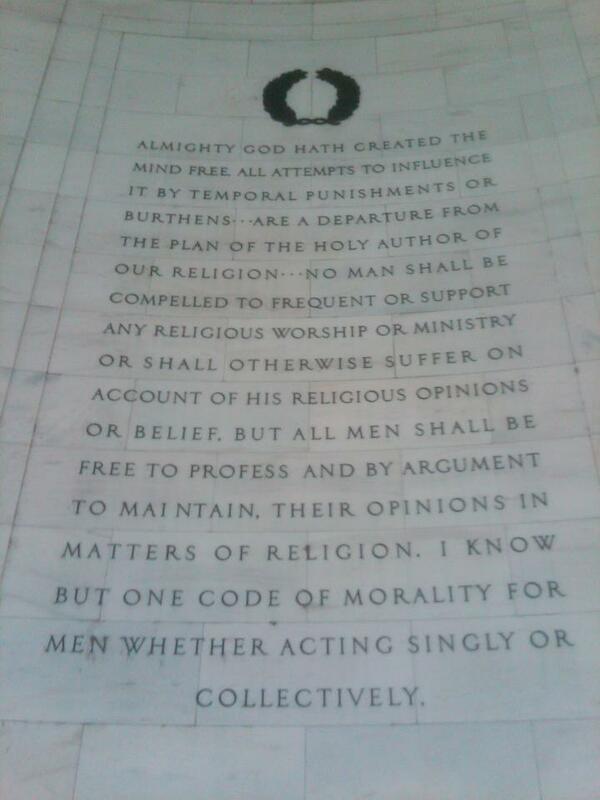 I guess this just highlights how complex our “Founding Fathers” actually were. In addition to the famously prominent signature of John Hancock from Massachusetts, the President of the Continental Congress, the remaining signatories of the Declaration of Independence consisted of: Josiah Bartlett, William Whipple and Matthew Thornton (who was the last man to sign the document, on November 4, 1776), all from the state of New Hampshire; Samuel Adams, John Adams (who later became the second President), Robert Treat Paine and Elbridge Gerry from the Commonwealth of Massachusetts; Stephen Hopkins and William Ellery from the state of Rhode Island; Roger Sherman, Samuel Huntington, William Williams and Oliver Wolcott from the state of Connecticut; William Floyd, Philip Livingston, Francis Lewis and Lewis Morris from the state of New York; Richard Stockton, John Witherspoon, Francis Hopkinson, John Hart and Abraham Clark from the state of New Jersey; Robert Morris, Benjamin Rush, Benjamin Franklin (who, at the age of 70, was the oldest to sign the Declaration), John Morton, George Clymer, James Smith, George Taylor, James Wilson and George Ross, all from the Commonwealth of Pennsylvania; George Read, Caesar Rodney and Thomas McKean from the state of Delaware; Samuel Chase, William Paca, Thomas Stone, Charles Carroll of Carrollton, from the state of Maryland; George Wythe, Richard Henry Lee, Thomas Jefferson (who later became the third President), Benjamin Harrison, Thomas Nelson, Jr., Francis Lightfoot Lee and Carter Braxton from the Commonwealth of Virginia; William Hooper, Joseph Hewes and John Penn from the state of North Carolina; Edward Rutledge, Thomas Heyward, Jr., Thomas Lynch, Jr. (who at 26 years old was the youngest person to sign), and Arthur Middleton from the state of South Carolina, and; Button Gwinnett, Lyman Hall and George Walton from the state of Georgia. 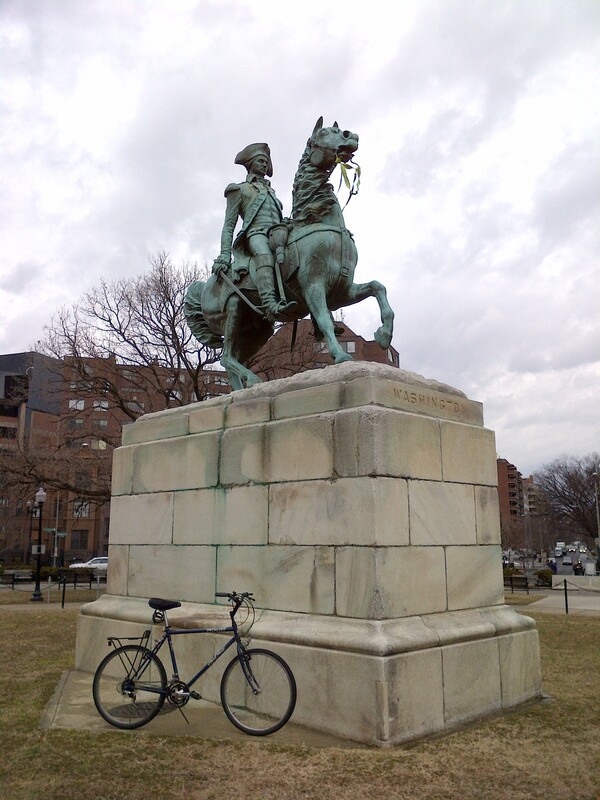 On today’s anniversary of his death in 1794, I chose the Statue of Doctor John Witherspoon at the intersections of Connecticut Avenue, N Street and 18th Street (MAP) in northwest D.C.’s DuPont Circle neighborhood as the destination for this bike ride. 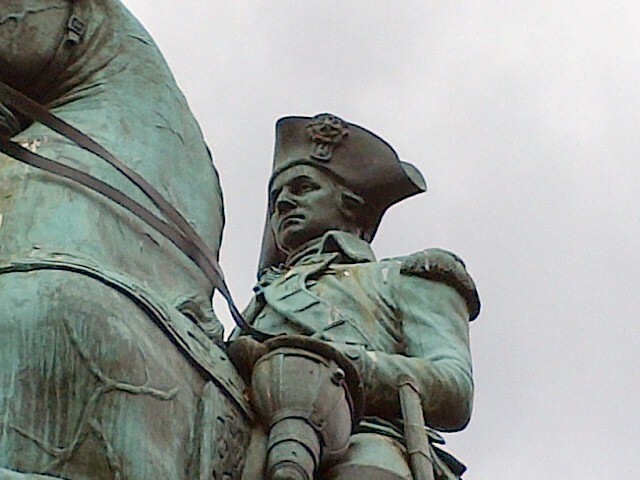 The bronze sculpture by William Couper is part of a group of fourteen statues in D.C. known collectively as the “American Revolution Statuary.” They are listed together as a group on the National Register of Historic Places, and are scattered across the city, mainly in squares and traffic circles. 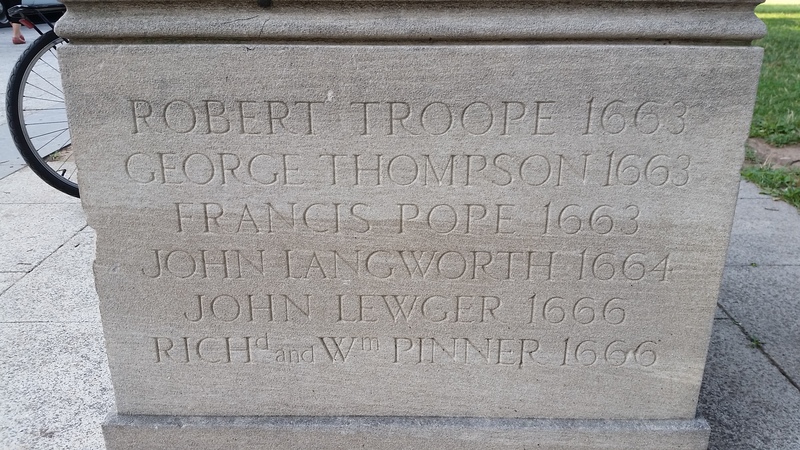 John Knox Witherspoon was born in February of 1723 at Gifford, a parish of Yester, at East Lothian, Scotland. 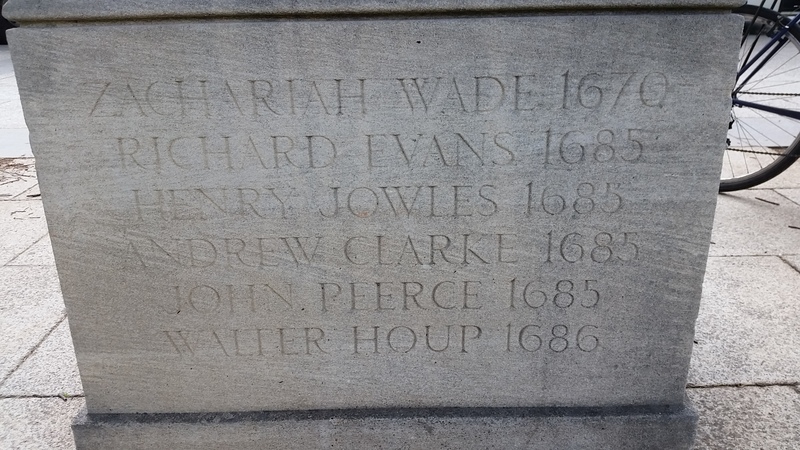 He was a Scots Presbyterian minister before he and his family emigrated to New Jersey in 1768 in order to become President and head professor of the small Presbyterian College of New Jersey, which would eventually become Princeton University. As a native Scotsman who was long wary of the power British Crown, Witherspoon came to support the Revolution in his new country. He was then elected in June of 1776 to the Continental Congress as part of the New Jersey delegation, and appointed Congressional Chaplain. 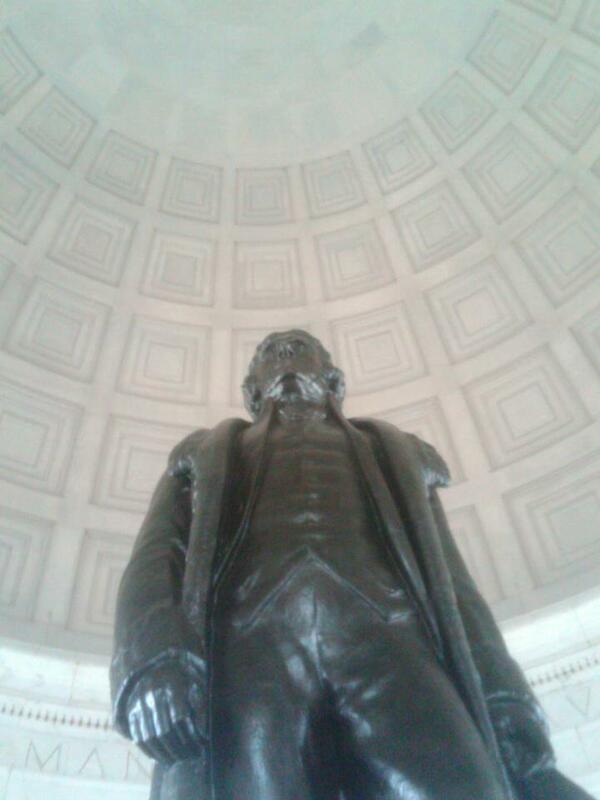 He voted to adopt the Virginia Resolution for Independence, which was finally approved on July 2, 1776. The text of the document formally announcing this action, the United States Declaration of Independence, was approved two days later, to which Witherspoon was a signatory, and the only college president to sign it. Witherspoon went on to serve in Congress until November 1782, and became one of its most influential members. He served on over 100 committees, spoke often in debate; helped draft the Articles of Confederation, and played a major role in shaping foreign policy. 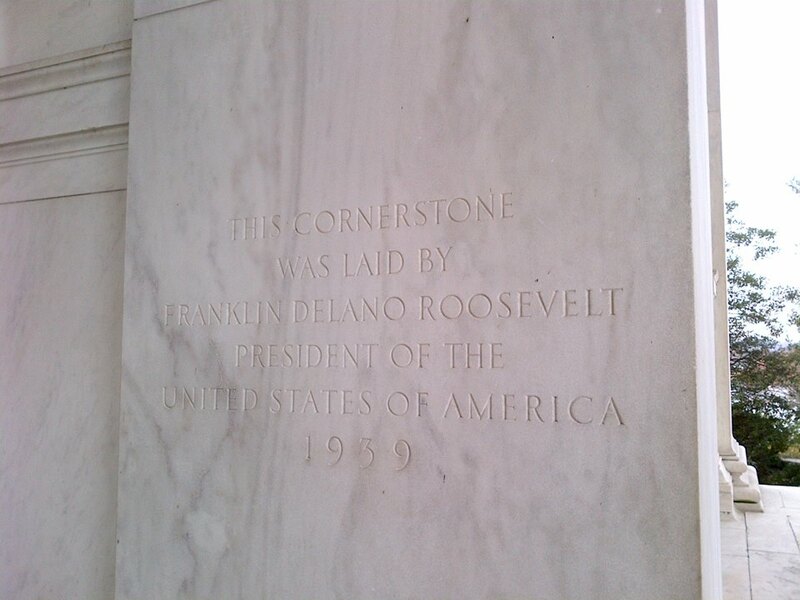 He also helped organize the Federal government’s executive departments. He later served twice in the New Jersey Legislature, and strongly supported the adoption of the United States Constitution during the New Jersey ratification debates. Actress Reese Witherspoon has claimed to be a direct descendant of John Witherspoon. However, it has been noted by the Society of the Descendants of the Signers of the Declaration of Independence that her claim has yet to be verified. The monument that towers over the National Mall in downtown D.C. is universally recognized as our nation’s memorial to the ‘father of our country” and first President, George Washington. Although it was initially proposed over one hundred years before its completion, it languished in the planning and construction stages for decades. Finally, on February 21, 1885, The Washington Monument was official dedicated. But few people know that the 555-foot and 5-inch obelisk was not the first monument built in D.C. to honor the new nation’s first leader. 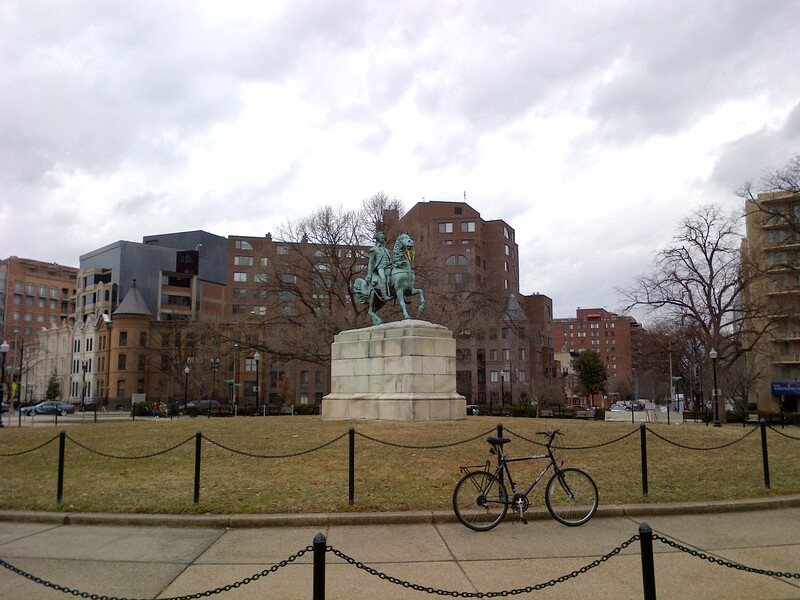 Twenty-five years earlier, on February 22, 1860, a statue to memorialize Washington was erected in D.C. On today’s bike ride, I went to that earlier Washington monument. The momentum to honor George Washington first surfaced before he died in 1799. The Continental Congress of 1783 passed a resolution to erect a monument to this hero of the American Revolution in the soon-to-be-built Federal capital bearing his name. 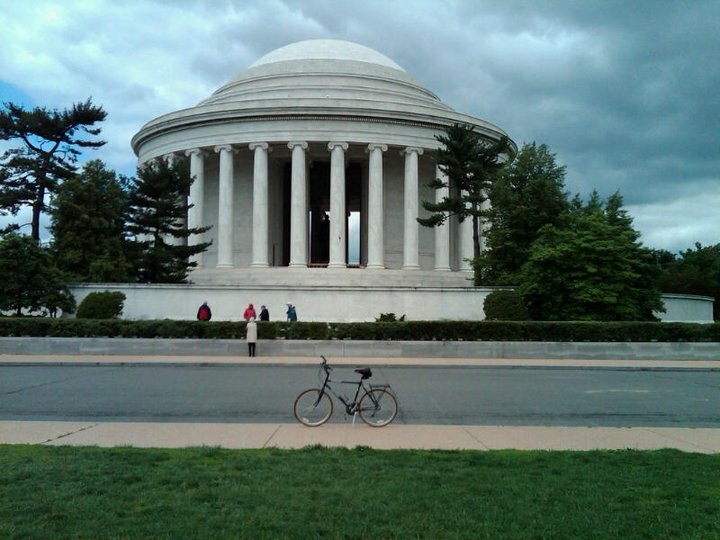 But when a frustrated President Washington was struggling to finance and oversee construction of the new capital city on the Potomac River, he pulled the plug on funding for his own memorial. 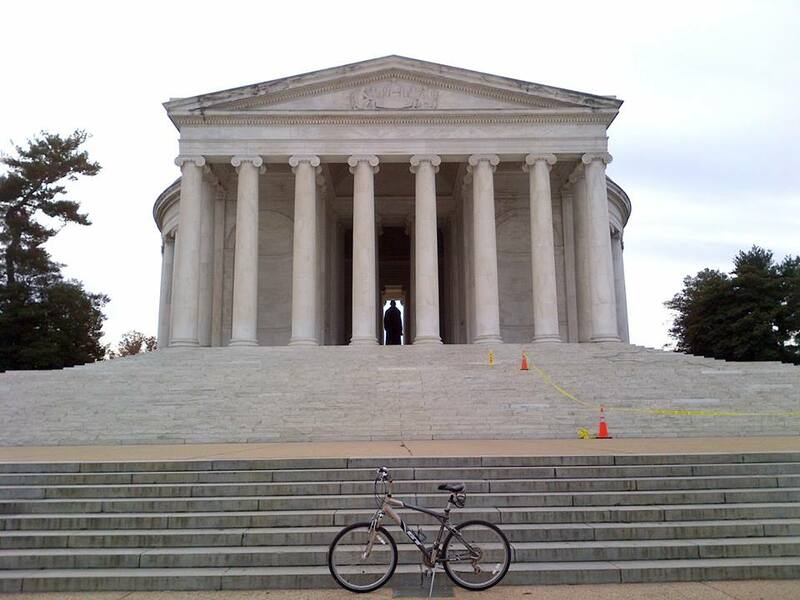 The project resumed when plans for a memorial were adopted during the centennial of Washington’s birth in 1832. Work on the project was interrupted by political quarreling in the 1850s, and construction ceased entirely during the Civil War. Finally, in 1876, inspired by the United States centennial, Congress passed legislation appropriating funding for completion of the monument. It was completed almost a decade later. By this time, however, the more modest monument, The Lieutenant General George Washington Statue, had already been installed almost a quarter of a century earlier. The bronze equestrian statue of Washington riding his horse during the Battle of Princeton depicts him in the heroic, idealized Romantic style. 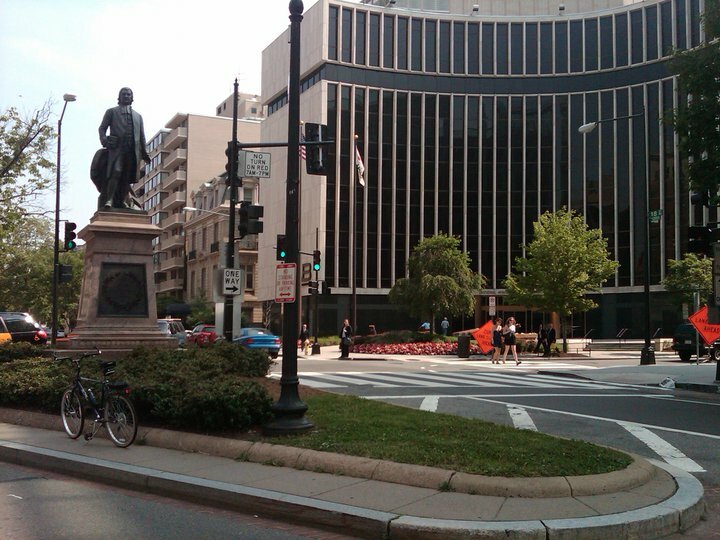 It was installed where the Foggy Bottom and West End neighborhoods meet, in the center of a park in the traffic circle at the intersection of 23rd Street, K Street, New Hampshire Avenue, and Pennsylvania Avenue (MAP). The statue is part of the “American Revolution Statuary“, a group of fourteen statues in D.C., and are scattered across the city, mainly in squares and traffic circles. They are listed as a group on the National Register of Historic Places. 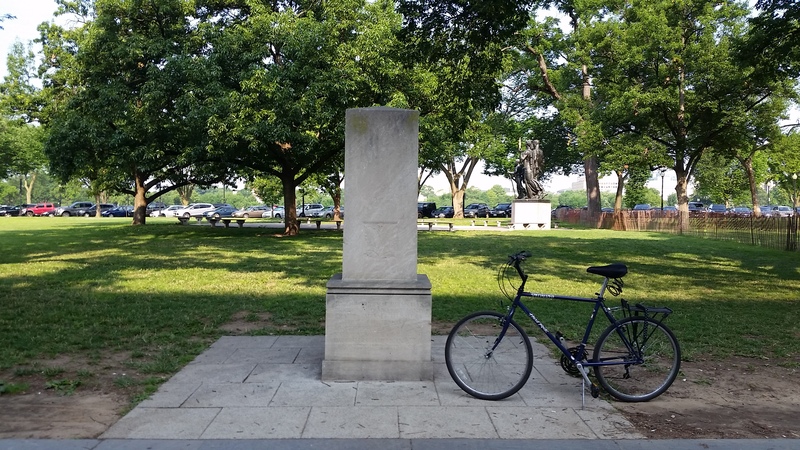 This monument may not be the most well known, or the biggest, but it does predate the more well-known monument on the National Mall. On this day I rode to the U.S. 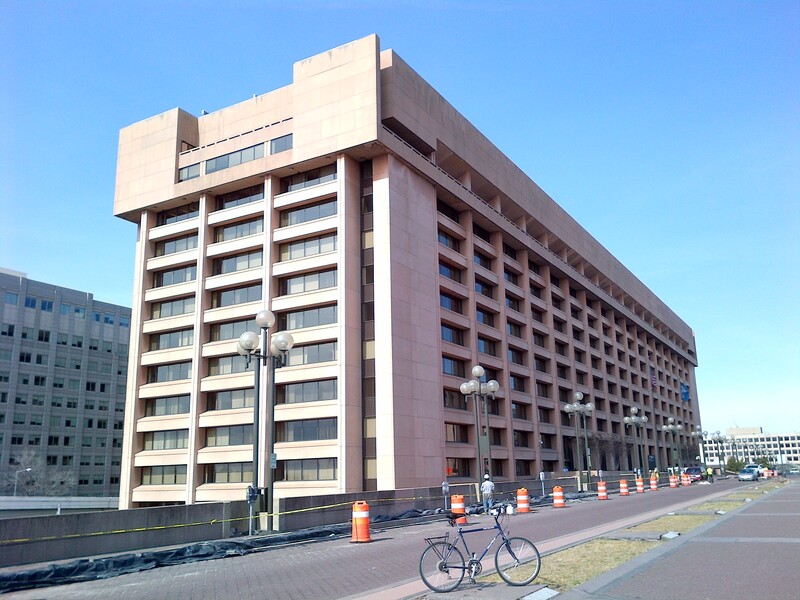 Postal Service Headquarters because on this day in 1792, President George Washington signed legislation creating the U.S. Postal Service. 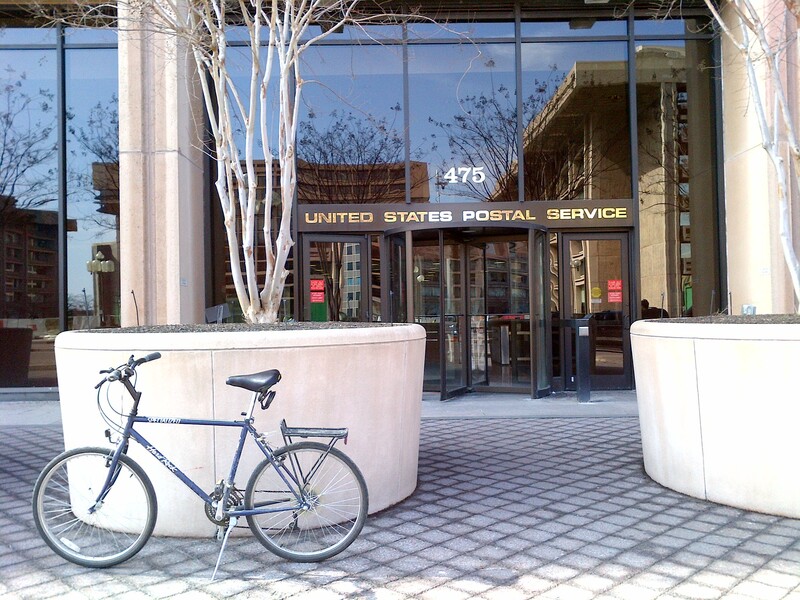 The USPS headquarters building is located in southwest D.C., at 475 L’Enfant Plaza (MAP). In 1707, the British government established the position of Postmaster General to better coordinate postal service in the colonies. In 1737, a 31-year-old American colonist named Benjamin Franklin took over as Postmaster General. He was later fired for subversive acts on behalf of the rebellious colonies in 1774. Franklin then returned to America and helped create a rival postal system for the emerging nation. The next year he was reappointed postmaster general by himself and other Continental Congress members. Although the Articles of Confederation written in 1781 authorized Congress to establish and regulate post offices from one State to another, the formation of an official U.S. Postal Service remained a work in progress until February 20, 1792, when President Washington formally created the U.S. Postal Service with the signing of the Postal Service Act. The act outlined in detail Congressional power to establish official mail routes. The act also made it illegal for postal officials to open anyone’s mail. In 1792, a young American nation of approximately 4 million people enjoyed federally funded postal services. The cost of sending a letter ranged from 6 cents to 12 cents. Under Washington, the Postal Service administration was headquartered in Philadelphia. Later, in 1800, it followed other federal agencies to the nation’s new capital in Washington, D.C. 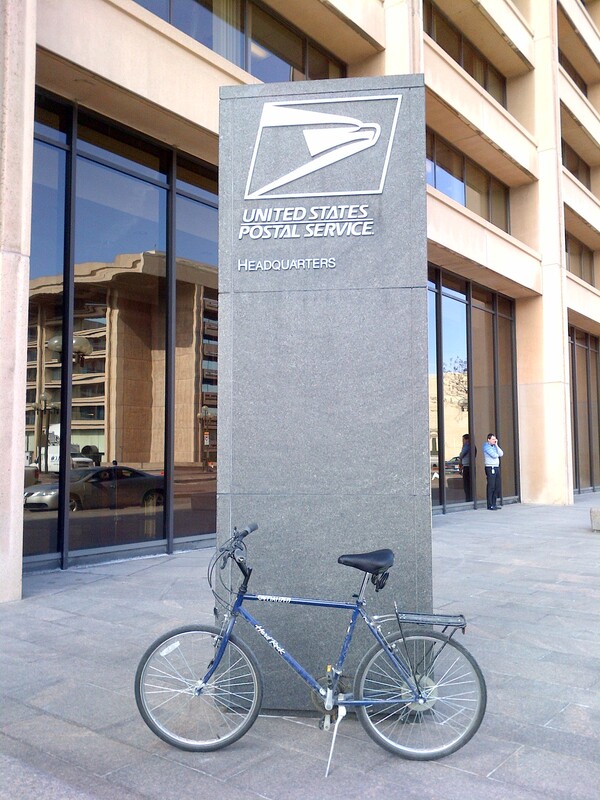 The Postal Service was transformed from a Federal agency into a corporation run by a board of governors in 1971 following passage of the Postal Reorganization Act. Today, the modern USPS sorts and delivers more than 700 million pieces of mail each day, except Sunday. It has the nation’s largest retail network, which is larger than McDonald’s, Starbucks and Wal-Mart in this country, combined. It is the nation’s 2nd largest civilian employer, with more than 211,000 employees. It has the world’s largest civilian fleet of vehicles, with approximately 212,000 cars and truck, at last count. The Postal Service also moves and delivers mail using planes, trains, boats, ferries, helicopters, subways, float planes, hovercraft, mule, and by foot. There are even some routes in the country where the mail travels by bicycle.